– 1 kilo of potatos (preferably from Noirmoutier). Wash 4 thin slices of truffles and place them in the bottom of a ramequin and add a sprinkle of olive oil. Cover with plastic film and place in fridge. Chop the rest of the truffle, add creme fraiche, cover and place in fridge. Brush the potatoes under water to remove any dirt. Place them in a pot, cover with cold water, add salt and bring to a boil. Let cook for 25 minutes at slow boil. Once cooked, peel them and mash them. 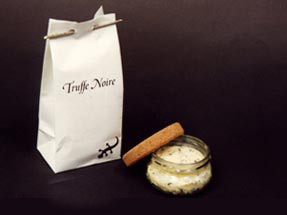 Melt butter and warm up the crème fraiche truffle mixture a bit. Add the warmed mixture to the potatoes and blend carefully. Serve on a warm plate with a white meat preferably; decorate with a slice of truffle set aside.